Tracking Spending on the Sustainable Development Goals: What Have We Learned from the Millennium Development Goals? In September 2015 countries from around the world adopted the Sustainable Development Goals (SDGs), officially known as The 2030 Agenda for Sustainable Development. The Agenda is a set of 17 aspirational “Global Goals” that cover such critical sectors as education, health, and sanitation and seek to address shared global challenges like climate change, gender inequality, and poverty. Because few, if any, of the goals are achievable without public financing, budget transparency, participation, and accountability are essential. 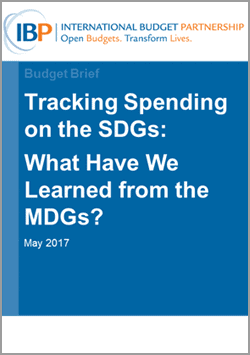 This Budget Brief explores good practices and lessons learned from monitoring of government budgets and expenditure on the Millennium Development Goals that can assist with monitoring, reporting, and accountability in respect of the SDGs. It features summaries of case studies from eleven countries.